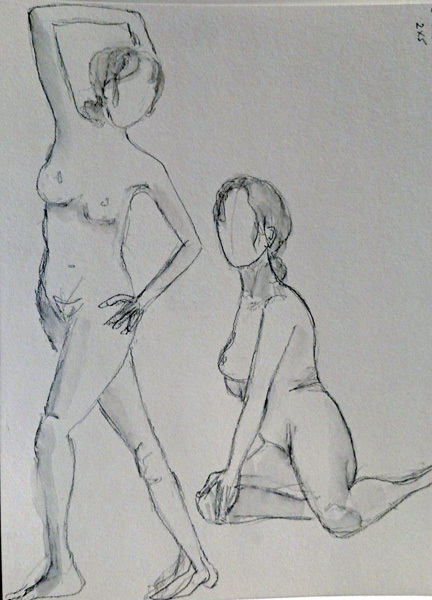 Two Meet-up Groups are co-sponsoring Figure Drawing weekly during these cold weeks of Winter. You must be a member of Meetup Draw New York or the Central Park Sketching and Art Meetup groups to attend, but it is really easy to join and both groups have drawing sessions in other indoor venues as well this month. These are just 4 of the drawings I did on February 14th. The drawings were done with a soluble graphite pencil and then shaded with clear water and a Niji waterbrush. They were scanned, adjusted, and resized in Photoshop. Glad to see your sketches! I'm amazed that you go out of your cozy home. The thought of your cold weather overwhelms me. Difficult poses! Nicely done, Shirley! That would be a great way to spend a cold day. It's nice you have drawing options like this in that big city. Nice sketches. Fantastic sketches/drawings. Life drawing is always so difficult. I really should get some soluble graphite - looks like fun.